This post is sponsored by Ragú®. 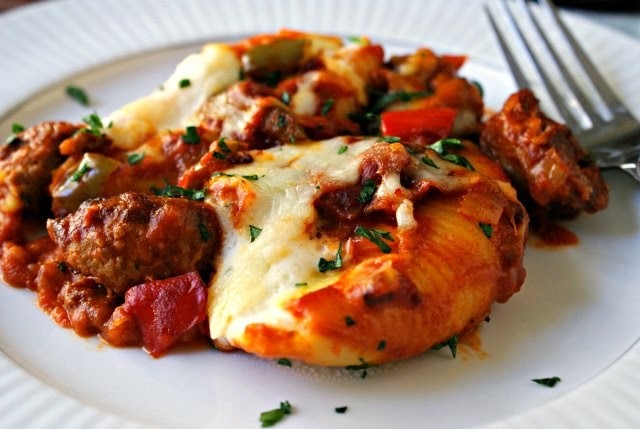 Sausage, Peppers, and Onions Stuffed Shells combine cheesy stuffed shells and the flavors of a classic sausage, peppers, and onions sandwich to make a hearty, easy to prepare, delicious meal. Sometimes we joke about how my family must have Italian hidden somewhere in our heritage, because we loooove us some Italian food. At many of our family gatherings, my mom makes pasta because it something everyone in the family loves to eat. We even have stuffed shells for Christmas dinner! I think that's why I love stuffed shells so much. It's pretty neat how certain foods can conjure up memories, isn't it? As much as I love stuffed shells, the hubs is not so much a fan. That's why I decided to mix it up a little and combine one of his favorites with one of mine to make a meal we would both enjoy. He loves sausage, peppers, and onions sandwiches and I knew that that would pair perfectly with my shells! 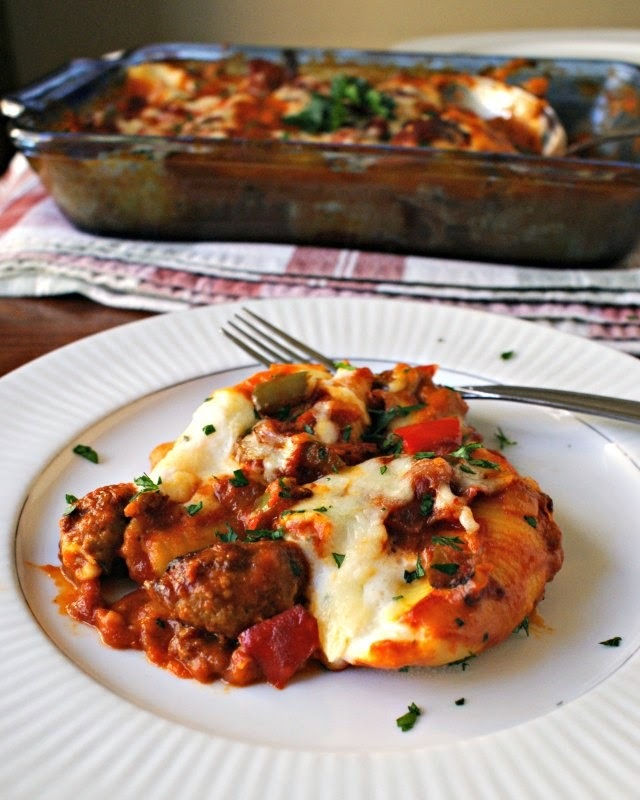 I started with Ragú's traditional Sausage and Peppers recipe, but diced the peppers (instead of slicing them), added some onions (because we love onions around here), then topped some stuffed shells with all of the sausage-y goodness. A New Tra-Dish! He loved it, I loved it, the kiddos loved it and our bellies were both very happy. For this recipe I used Ragú® Old World Style® Traditional Sauce, which is made with 11 juicy tomatoes making it its richest, thickest recipe. Ragú® has the authentic Italian taste American family's love and a variety of great tasting, quick and easy to make family favorite recipes. You can check out Ragú's Facebook page at www.Facebook.com/RaguSauce for more quick, easy and delicious recipe ideas! Preheat your oven to 400°. 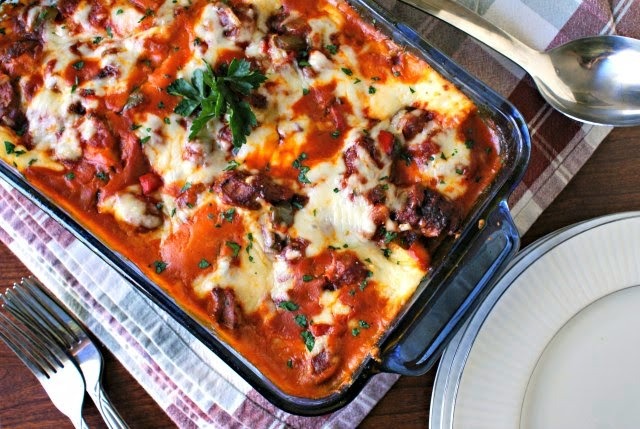 Pour 1/2 cup of the pasta sauce into the bottom of a 2 quart glass baking dish and set aside. Heat the olive oil in a large skillet over medium-high heat and brown the sausage on all sides. Remove the sausage to a cutting board and slice into 1/4 inch slices. Return the cut sausage to the pan and add the peppers, onions, and oregano. Cook, stirring occasionally, for 5 minutes or until the vegetables are tender and the sausage is cooked through. Stir in the remaining pasta sauce. Place the stuffed shells into the baking dish. Cover the shells with the sausage, peppers, and onions. Cover and bake for 35 minutes. Uncover and sprinkle on the mozzarella cheese. Bake uncovered for an additional 5 minutes. Sometimes I stuff my own shells, and sometimes I don't. Honestly, I like them both ways, so if I'm looking for a little less work, or if I'm short on time, I used the frozen pre-made shells. This is a sponsored post written by me on behalf of Ragú® brought to you by Yummly. All of the opinions expressed are 100% my own.